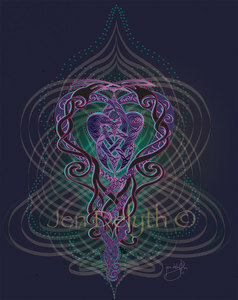 Serpent Ravens - tribal heart - illustrates the raven-headed serpents as a torc (sacred neck ornament of the Celtic kings and divinities ) intertwined around the tribal heart design - showing that life and death are interconnected, that one is not possible without the other.. Ravens are a symbol of rebirth and regeneration. The tribal heart beats with the music of life, of love, and of loss, courage and compassion, all intertwined with the wisdom of the Ancestors. Knotwork pattern express the Mystery of life and the interconnection and balance of all things.